Recently, Microsoft enhanced the business intelligence capabilities available with Dynamics NAV to support users making informed decisions. These enhancements relate to reporting, charts and KPIs as well as ad-hoc queries and analyses. Charts help to picture the business. They provide a visual model for business data, and – at least equally important! – for data dependencies. We all know the saying, “A picture is worth a thousand words”. Showing even complex business data and their dependencies will help even less experienced users to better understand the data. Charts help to understand the business. It is not just about understanding data. The data are a representation of the business, and hence understanding data means understanding the business. Charts can show trends, correlations, conflicts and issues. The more flexibly the user can interact with the data (e.g. slice and dice), the higher the information value of the charts. Charts help taking actions. Intelligent graphs help users to find the crucial data points within a huge data set. They help focusing not on all, but on the relevant information. As such, charts can help visualize conflicts and hence trigger actions. Charts help taking the right actions. Identifying an issue is one thing, but defining the appropriate counter measure is another challenge. Charts can be interactive and can enable the user to create what-if analyses on the fly so that he can assess the potential outcomes of alternative actions; especially if graphs also work with data dependencies. Hence, the user can make an educated decision rather than acting on best guesses. However, these business intelligence enhancements are centered on (standard) financial, accounting, customer, creditor and supplier information. Task- and time-centric scheduling data as they are used for production, resource, project or service schedules still are presented to the users solely in tabular forms. Hence, users of the manufacturing, the jobs, the services and the resource planning module fully lack the visual model of the business data which is relevant to them to achieve their goals. They need to maneuver through tables, cards and pages leading to situations in which they literally spoken do not see the forest for all the trees. Within the standard Dynamics NAV system, the users of the mentioned modules cannot easily understand the consequences of potential decisions, and they do not get visual alerts that help them focus on the relevant data. This also explains why visual scheduling should be a concern for any NAV user. What will happen to my production order if I squeeze in another urgent order before, which came in unexpected? Will I be able to keep delivery commitments for both orders? What will happen if I start my production late? Will this create capacity conflicts with another production order that is supposed to run at the same machine? A project task runs late: Is this task already on the critical path and will this delay have an impact on the overall schedule or not? The fulfillment of a service order runs longer than expected. Will the service technician be able to complete all service orders today? Or do I need to send another technician out so that we can keep all commitments made to our customers for that day? 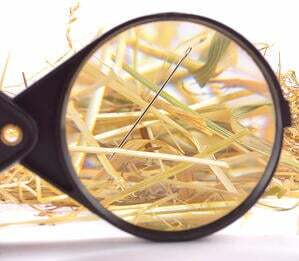 In reality, finding the answers to these questions often is like searching the needle in the haystack. And of course, there are more questions like this. They all are related to the question whether Dynamics NAV enables users of the manufacturing module, the jobs module and the service module to achieve the needed level of operational agility. Definitively, data is there to get there. However, data is hidden in and spread across pages, tables and cards: It simply takes too long to understand the data, the business and to make the right actions. You also can phrase it like this: Dynamics NAV is a data treasure, but when it comes to time-related scheduling data, it provides no fast path for users to get to this treasure. Hence, users of Microsoft Dynamics NAV definitively can benefit from visual scheduling solutions – these solutions help them to unleash the potential of the data treasure that NAV comes with. Want to learn more about Dynamics NAV visual scheduling? 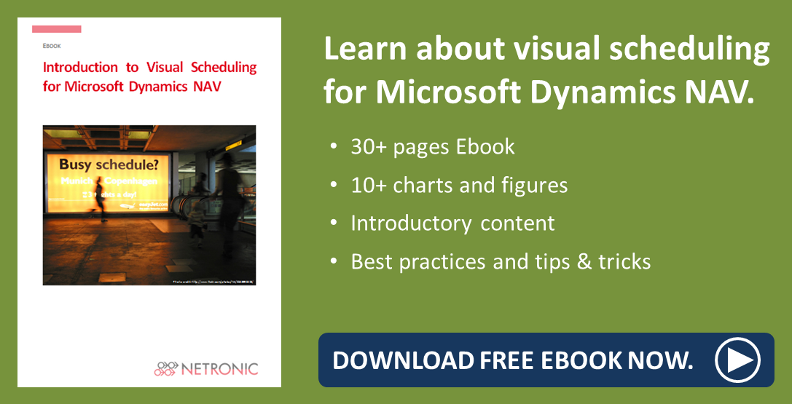 Read our complementary Ebook "Introduction to Visual Scheduling for Microsoft Dynamics NAV".